It was barely 7am as we stood yawning at the bus stop with bleary eyes and mussed-up hair, waiting for the bus that would take us from Busan to our dream destination. I was knackered, having slept only five or so hours each night for the past week as we rushed through Seoul’s markets and palaces and the DMZ. But it was the right day; it was the final day. I had traveled here just for this, the quintessential experience of spring in Korea. As the bus trundled along, the streets acquired gradients of green, soft yellow, and white. Eventually, the roads were lined entirely with pink trees as we arrived…in Jinhae. Cherry blossoms as far as the eye can see. 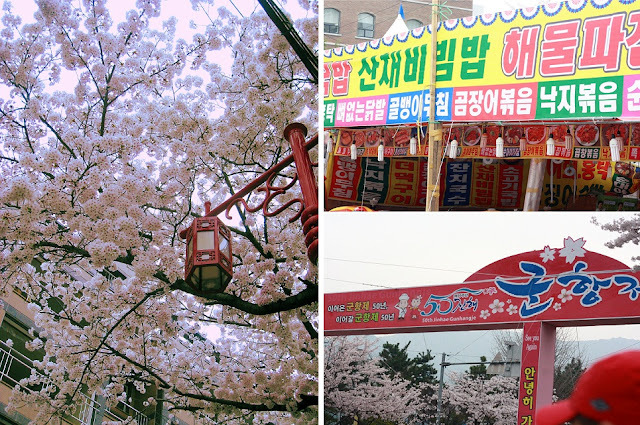 Jinhae is often considered the best place to view cherry blossoms in Korea, and the Jinhae Gunhangje is held from 1-10 April annually – when the cherry trees are most likely to be in bloom. Cherry blossoms (벚꽃, beotkkot) have traditionally been associated with Japan, where they’re known as sakura. However, Korean historians claim that Korea has its own native species of cherry tree and that the Japanese, during their occupation of Korea, razed most of them to plant their own trees. Studies conducted on cherry trees in various parts of South Korea showed that the trees planted in most places, including Jinhae, are of the Japanese native Yoshino cherry species. Jeju Island, however, is home to an endangered species of Korean native cherry tree known as the King cherry. Confused yet? Don’t be – just be mesmerized by the blooms! We spent an hour strolling along the quiet boardwalk, mesmerized. People flock from all parts of South Korea to see the entire city draped in soft pink snow. Luckily, at 8am in the morning, we were virtually alone and free to go ooh-ing and ahh-ing over the scenery like the ignorant tourists that we were. The views are stunning – especially at the landmark Yeojwa stream (여좌천, yeojwacheon). Sadly, we only had two hours and barely got to know this place, for we had to catch a bus back to Seoul and onto our flight home. Yes, we spent a day’s time journeying south and back, just for a glimpse of the city of cherry blossoms in all its glory – and it was worth it. Because Jinhae city is not served by Korea’s rail network, it requires slightly more travel time and patience. To get from Seoul to Jinhae, your most straightforward option is a 4.5-hour intercity bus ride from Seoul Nambu (South Seoul) terminal. Tickets cost KRW 26,100 for adults and you can purchase them online from the TxBus website. Find more tips for traveling from Seoul to other parts of South Korea within this guide. Alternatively (and I’d recommend this), consider making Jinhae a day trip from Busan. From Busan to Jinhae, you can take an intercity bus from Busan Seobu (West Busan) Bus Terminal to Jinhae Intercity Bus Terminal; the ride takes only around 45 minutes. This route is active as of 2017 (price is now KRW 5,100) but tickets are not available on the TxBus site yet. 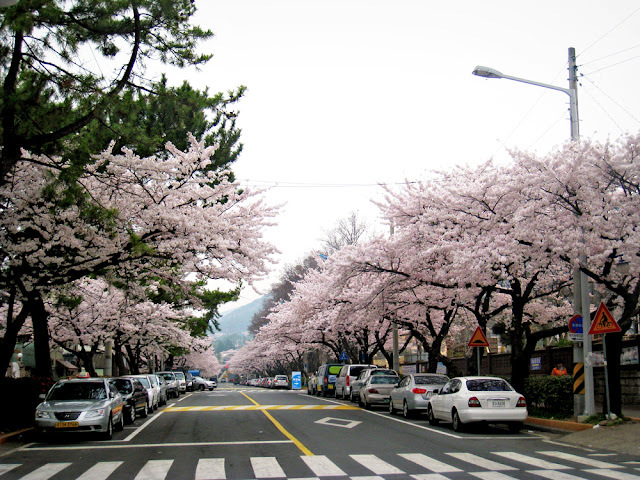 Would you travel to Jinhae to view the cherry blossoms during spring in Korea? What are your other favorite spring destinations in Korea? Love that Korea’s cherry blossoms are getting some love. Thanks for sharing the history about the different species, too. I love when travel guides are interwoven with history. I have been meaning to see cherry blossoms in Spring for the longest time, all blooming and fragrant. I have always had my eyes set on Japan, but now I’ve seen photos recently of China and now here, South Korea that have me really thinking otherwise. Great photos and something to look forward to! I’d love to see the cherry blossoms in Japan too, just because it’s such a huge deal to locals. I saw them in Taiwan but they don’t get special treatment there, they’re just roadside trees. Wow! The cherry blossoms are so beautiful. I would love to see them up close, I haven’t been to Asia at this time of year and I think I need to! Omg this is sooo pretty! I would love to visit this place to see the city wearing its spring coat with cherry blossom. Very pretty! And wow, you spent so much time commuting just for these views, really admirable. The memories are for ever though! I did see cherry blossoms in Seoul when I was there few years back, though they pale in comparison to what your post showed me. This is so beautiful!! I’ve always heard about the cherry blossoms in Japan, but looks like Korea has some worth visiting as well! I visited Korea for the first time last August and saw how many cherry trees they have! Definitely coming back for more! Still remember how we were driving in Busan to Haeundae side from the temple and taxi driver told us that the whole road ahead of us is just cherry trees. I am still amazed that Korea is not well know for this experience, as your pictures suggest it is stunning in spring! I guess most people would still prefer to view the cherry blossoms in their “origin” Japan! It’s not nearly as maniacal in Korea, that’s for sure. Thanks, Jinhae’s much more well-known now compared to when I went 😛 I still need to see the sakura in Japan!